Maria Kalaniemi (born 1964) is one of the foremost accordionists in Finland; she completed seven years of study at the Sibelius Academy and now teaches there. In addition, she was a founding member of one of Finland's most popular contemporary folk music groups -- Niekku -- recognized as a pioneer of the "New Finnish Folk" movement. 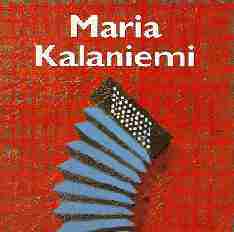 From the driving accordion melody in Harmannin Riili (The Reel of Hermanni) -- a composite of the folk and jazz idioms -- to the deliciously sweet final accordion solo (Tahdet Taivahalla), Maria Kalaniemi's CD is a monument to the artistry of the folk accordion. Her accordion never shuts up during the entire album, but I didn't mind at all; her playing is dynamic yet sensitive, powerful yet gentle. I cannot praise this CD enough. Taklax I, masterfully performed by fiddler Sven Ahlback, was taken from an early 1900 cylinder recording of the the Swedish fiddler Johan Erik Taklax who hailed from Korsnas in Southern Ostrobothnia. One of my favorite moments in the piece is the entrance of the low drone on the left-hand manual of the accordion; I found it positively exhilarating. Much of the album features interesting duet arrangements featuring the accordion and fiddle. The tango, Olin Sairas Kun Luokseni Saavuit (I Was Sick When You Came To Visit Me) -- a tune taken from an old Gypsy melody -- features Timo Alakotila on piano, who provides a perfect accompaniment for Kalaniemi's accordion. I believe her rendition is faithful to the New Tango tradition founded by the late great Argentinean bandoneonist Astor Piazzolla; in this track Kalaniemi played her accordion remarkably like a bandoneon. Farmorspolskan (Grandmother's Polska) is a Swedish tune from Alvdalen said to be made by Gyris Anders in the nineteenth century. Varpusen Polksa (Sparrow's Polska) originated from Liminka in Ostrobothnia and was taken from an 1870 transcription by Robert Lehrbach. Hjortingen is a traditional polska from Jhort Anders (1865-1952), one of the great fiddlers of his time, from Bingsjo in Dalarna, Sweden. My complaint: this CD is ridiculously much too short! only 40 minutes. None-the-less, I recommend this CD for all lovers of folk music.